IoT-enabled wearable devices are becoming an increasingly important part of enterprise mobility strategies. As the endpoint for IoT networks, these devices can take advantage of cloud-based data sets to help businesses facilitate inter-employee communication and operate more efficiently and effectively. In key industries like healthcare, government, retail and transportation, businesses are relying on these technologies to help them solve challenges and better serve their customers. From providing patient care to promoting worker safety to preventing employee fatigue, enterprise technologies featuring IoT-enabled wearable devices are helping businesses become safer, more agile and more responsive. Let’s look at three recent examples of these products, which are helping enterprises to coordinate tasks, monitor behaviors and connect with a central communications hub. It all adds up to employees that are more efficient, delivering services that are more productive. With Reemo, healthcare providers can use an analytics platform on the Samsung Gear S2/S3 to improve outcomes in senior living facilities. 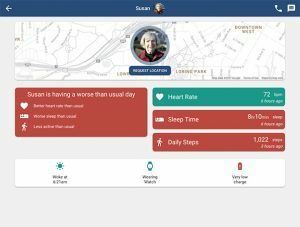 Through an intuitive dashboard system that monitors an integrated IoT network, caregivers can monitor patients in new and better ways. They can check on the residents’ locations and health vitals. They can access necessary mobilize resources, in case of a fall or another emergency situation, in real time. And patients can get regular notification reminders when they need to go for a walk or take their medication, giving them more control over their own health. Wearables give caregivers a better quality of care, and residents a better quality of life. SoloProtect’s offering on the Gear S3 increases the safety of employees who work predominantly alone or under high-risk conditions, like utility repairmen working on elevated surfaces or delivery professionals entering people’s homes. The technology lets employees wearing the device communicate with a central hub that monitors user biometric information. If there’s an accident, the device can notify emergency responders with an alert that includes the employee’s location information and vital measurements. With SoloProtect, employees can have the confidence and peace of mind to get the job done, no matter where it takes them. Ability Wearables is a fatigue management technology that uses the Gear Fit2 to track the fatigue of employees that work long shifts or operate in physically demanding environments — from construction sites to interstate trucking routes to international shipping ports. Using Ability Wearables’ platform, the device will monitor employee vital signs, like heart rates and stress levels, and alert workers if they become too tired or if it is risky for them to continue the shift. Employees will be more alert on the job while employers can balance productivity and safety by minimizing the chances of a workplace incident. It all adds up to a work environment that is safer and more productive for everyone. Technologies like those from Ability Wearables, SoloProtect and Reemo demonstrate the broad range of applications for IoT-enabled devices for businesses. By incorporating IoT-enabled wearable devices into your enterprise deployments, you can harness the full potential of your mobility strategy — and improve outcomes for your business, your employees and your customers. Should BYOD management strategies limit users to specific devices? Technology shouldn't be a limitation to what an individual should carry. Infrastructure to be designed for secure means. BYOD is driven by consumerization and the empowered user. Yes there's risk implicit in BYOD; however, except for specific VXI/VDI environments requiring robust end zone control (for compliance reasons, etc. ), allowing complete freedom of choice will amplify the BYOD benefits over the mid- and longer term, namely improved workforce optimization, productivity, collaboration and accidental knowledge gains. After all - profit is a function of risk.